– Julian Lloyd Webber, The Guardian, January 2012. He is the only cellist to have studied with both Gregor Piatigorsky and Mstislav Rostropovich. Two months before Pablo Casals died, Maisky, then 25, played the Bach Suite No.2 in D Minor for him in August of 1973, in an Israeli hotel suite in front of Casals, his wife Martita, Isaac Stern, Leonard Rose, Eugene Istomin and Alexander Schneider. Maisky has recorded the Bach solo cello suites three times, most recently for Deutsche Grammophon in 1999. Before Maisky performed at Roy Thomson Hall with the Moscow Soloists and Yuri Bashmet on May 3, 2012, he appeared on Classical 96.3 FM, where he likened Bach’s Cello Suites to a great diamond which can shine differently depending on which way you look at it; he called the study of the suites a neverending process. After studying with Rostropovich for four years (from 18 to 22), Maisky spent 18 months in a labour camp, “shovelling cement, building Communism, obviously unsuccessfully,” as he says sarcastically in an interview from the Verbier Festival in 2012. Then, to avoid military service, he had a friendly Jewish psychiatrist place him in a mental hospital for two months, after which he followed his sister to Israel and “repatriation.” Maisky attributes the curtailment of his concertizing and other musical activities, as well as the trumped-up charge that landed him in the labour camp, to his older sister’s move to Israel in 1969, a move the Soviet authorities were convinced (rightly as it turned out) Maisky would also make. Maisky’s career revived in Israel where he played seven concerts with the Israel Philharmonic under Zubin Mehta, Andrew Davis and Daniel Barenboim. “Mehta was very friendly with Piatigorsky and he recommended that I go to him as well. He said, ‘You have the time and he’s not young and he’s not healthy. You never know how long he will be around, so go. You will never regret it.’ And so I went to Piatigorsky [in 1974, for four months] and I’ve never regretted it, though I must confess that my career could have gone in a completely different direction had I listened to Isaac Stern’s advice, who told me to go to New York instead of Los Angeles. Mischa Maisky will perform Bach’s Solo Cello Suites Nos.1, 4 and 5 at 4pm and Bach’s Solo Cello Suites 2, 3 and 6 at 8pm, May 7 in Koerner Hall. The TSO: The TSO’s season shows no sign of letting up, even as it enters its penultimate month. May 4 and 5 violinist Leila Josefowicz continues her championing of contemporary music in Scheherazade.2, John Adams’ riff on Rimsky-Korsakov’s Scheherazade. Peter Oundjian also leads the orchestra in Brahms’ seminal Symphony No.4. May 13 and 15 Julian Rachlin is the soloist in Mozart’s irresistible Violin Concerto No.5 K219 “Turkish,” written when the composer was 19. But the evening’s major attraction will be Shostakovich’s Symphony No.13 “Babi Yar,” the composer’s setting of five poems by Yevgeny Yevtushenko, including the searing indictment of anti-Semitism, Babi Yar. Conductor Andrey Boreyko is joined by bass soloist Petr Migunov and the basses of the Amadeus Choir and Elmer Iseler Singers. TSO Conductor Laureate, Andrew Davis, returns to the podium May 25 to conduct Richard Strauss’ vivid musical travelogue, An Alpine Symphony. May 26 and 28 the program expands to include Janácek’s Taras Bulba, Elgar’s Sospiri and Ives’ “Decoration Day,” the first installment of the Decades Project 1910-1919. June 1 and 2 Basque conductor Juanjo Mena takes up the baton as the Decades Project 1910-1919 continues with Granados’ famous Intermezzo from Goyescas, Nielsen’s imposing Violin Concerto (featuring Finnish violinist Pekka Kuusisto) and Ravel’s impassioned Daphnis et Chloé. May 5: When Honens laureate Pavel Kolesnikov appeared in Toronto last year as part of the Piano Extravaganza, he revealed that he had Chopin specialist Maria João Pires as a mentor. Now he returns to conclude the Women’s Musical Club of Toronto season with a pleasingly packed program that includes two sonatas by C.P.E. Bach, Beethoven’s Sonata No.30 Op.109 and a Chopin selection of Nocturnes, Mazurkas and Scherzo No.4. May 6: The always interesting group of 27 downsizes for their final concert of 2015/16: Jocelyn Morlock’s duet for violin and viola, Blue Sun; Nielsen’s ingratiating Wind Quintet; and Schubert’s String Trio D.471. May 7: Wunderkind Leonid Nediak (b. 2003) is the soloist in Rachmaninov’s romantic masterpiece, his Piano Concerto No.2 Op.18 with the Kindred Spirits Orchestra, conducted by Kristian Alexander. Alexander told me last month that “Leonid is a great communicator, able to unlock the emotional content of the piece and unfold the storyline of the composition. 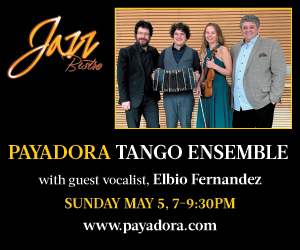 He also has a reach and versatile palette of colours, natural sense of phrasing and flawless energy flow.” Interestingly, Nediak’s teacher, Michael Berkovsky, is the collaborative pianist May 16, when Music Mondays present the Flautas del Fuego flute duo. May 22 Berkovsky then joins violinist Conrad Chow at the George Weston in Piazzolla’s intoxicating Four Seasons of Buenos Aires. And Music Mondays continues May 23 with Schubert’s marvellous “Trout” Piano Quintet in A Major D667. May 8: Best title of the month,Sweetwater Music Festival presents Few & Fewer, featuring artistic director Mark Fewer on violin and Guy Few on trumpet, along with pianist Stephanie Mara in a crowd-pleasing Mother’s Day program: Sarasate’s Zigeunerweisen, Puccini’s Morire, Saint-Saëns’ Sonata in D Minor, Op. 75, Three Preludes by Gershwin and ’Round Midnight by Thelonius Monk. May 12: The Kitchener-Waterloo Chamber Music Society presents Boston-based Irina Muresanu in a solo violin recital, “Four Strings Around the World,” featuring music by Prokofiev, Enescu, Paganini, Kreisler, O’Connor, Piazzolla and more. May 20, the K-WCMS brings the Xia Quartet (Edmonton Symphony Orchestra concertmaster Robert Uchida, TSO violinist Shane Kim, TSO assistant principal viola, Theresa Rudolph, and TSO principal cello, Joseph Johnson) to their music room in program of Schubert, Bartók, Debussy and John McPherson. May 16: Xia Quartet members cellist Joseph Johnson, violinist Shane Kim and violist Theresa Rudolph put on their TSO hats when they join concertmaster Jonathan Crow and pianist Angela Park for an Associates of the TSO concert that includes music by Dohnányi, Schumann and Prokofiev. May 18: Toronto Summer Music artistic director Douglas McNabney previews TSM’s upcoming “London Calling: Music in Great Britain” program with a COC free noontime concert at the Richard Bradshaw Ampitheatre. May 21 Shannon Mercer, soprano, Andrew Burashko, piano. Yehonatan Berick, violin, and Rachel Mercer, cello, perform Shostakovich’s Trio No.2 and Seven Romances on Poems by Alexander Blok Op.127 in Hamilton’s 5 at the First Chamber Music series’ final concert of the season. May 26: James Ehnes brings his 40th Birthday Tour to London under the auspices of Jeffery Concerts. Four days later, May 26, he and his collaborative pianist, Andrew Armstrong, continue the tour for Bravo Niagara! May 29 and 30: The Canzona Chamber Players present two pillars of the chamber music repertoire, Beethoven’s Septet in E-Flat Major Op.20 and Schubert’s Octet in F Major D803.